A woman who reported that someone stole her purse from a Boystown bar and then drove off with her car has been reunited with her vehicle. Residents of the 3800 block of N. Racine reported a "suspicious vehicle" parked curbside with its hood up at 9 o'clock Thanksgiving morning. Officers tracked down the owner. The people who reported the suspicious vehicle told officers that it had been parked in the same spot for nearly a week, long before the owner claimed that her car had been stolen. Police were called to the Center on Halsted for at least the third time this week. I can confidently say the individuals that are committing crimes in the area are not coming here for our services. The Circle K/Shell service station at Addison and Halsted called police to report that a man who previously stole from the store had locked himself in the store's rest room. An officer made contact with the individual, a 21-year-old white male, 5'10" tall, 220 pounds, wearing a red coat, whose last known address is the former location of the Broadway Youth Center: 3837 N. Broadway. How short-handed is our police district? So short-handed that four of its 15 police beats did not have cars assigned to patrol them this morning. 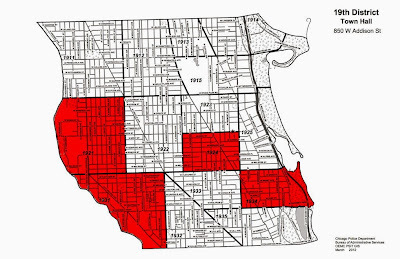 Among the areas with no beat cars on the a.m. shift Saturday was beat 1924, which covers the heart of Wrigleyville and Boystown. Needless to say, when a district doesn't have 26% of its beats covered, things get very busy for the officers who are working. Dispatchers ran out of cars to handle calls several times during the shift. The beats that had no assigned officers this morning are colored red in the map. A lot of the offenders are not from this district…My thought is to put a wall around the district and stop all the crap from coming in. That is Commander James Jones of the neighboring 20th district, speaking the truth to a community meeting, according to a story on DNAInfo. If our commander were to offer a thought like that, he would be labeled 15 kinds of an "-ist." PS—The bulk of our offenders do not live in our district, either.